Dehydrating fruit reduces pounds of juicy goodness into ounces. Dehydrating Fruit Fact: Half a cup of dried apples is equivalent to one and a half small apples and weighs one ounce instead of half a pound. Photo below shows half-cup servings of dried fruit packed in 3 x 5 bags. 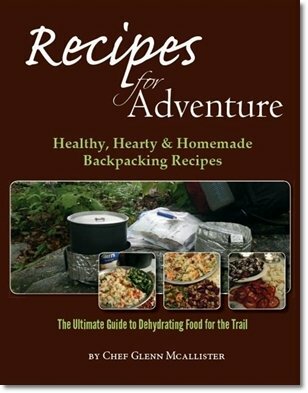 I snack on dried fruit each day on the trail, and also include it in oatmeal and dessert recipes. Another great idea is to rehydrate it with cold spring water back into refreshing fruit cocktail as described on this page. 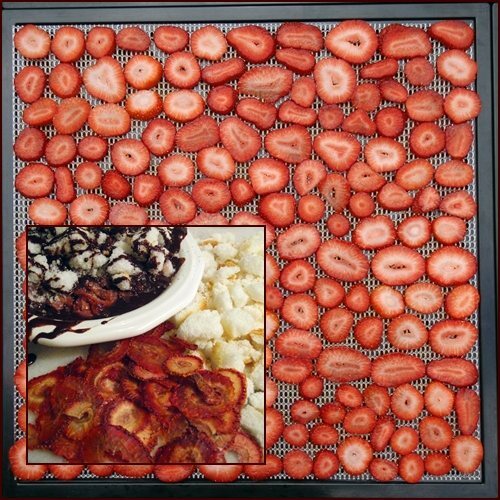 I use Excalibur Dehydrators for dehydrating fruit because the large square trays hold more fruit than round dehydrators with holes in the middle. The photo above right shows one pound of bananas, about what you could fit on a small round tray, with room for more on an Excalibur tray. Choose mature, firm fruits for the highest sugar and nutritional content, but avoid bruised or overripe fruit. Wash and rinse the fruit to remove wax and pesticides if dehydrating fruit with the skin on. Cut fruit into small pieces about ⅛ inch thick and spread in a single layer on the dehydrator trays. Most fruit will be pliable or leathery when done, meaning you can bend it and tear it, but it won’t be so dry that you can snap it. The range of drying times listed below for dehydrating fruit are what you could expect using an Excalibur Food Dehydrator. Factors such as dehydrator model, humidity, thickness of your fruit pieces, amount of fruit in the dehydrator and juiciness all affect how long it takes fruit to dry. Dehydrating apples for sweet potato porridge. Quarter the apples from top to bottom, cut out the core and stem. Slice the quarters crosswise into ⅛ inch thick pieces. Apples will start to turn slightly brown within minutes of cutting and exposing the flesh to air in a process called oxidation. If you get your apples in the dehydrator right away, the color change will be minimal and vitamin content and taste will be well preserved. Most fruits undergo some oxidation including pears, peaches, pineapples and bananas. Over time, oxidation will diminish the vitamin content and flavor of fruit. Vacuum sealing or using oxygen absorbers will diminish the rate of oxidation if you need to store fruits for longer than a few months. If you want to pre-treat before dehydrating apples, dissolve one tablespoon of pure crystalline ascorbic acid (available at health food stores) in one quart of cold water. Place fruit in solution for ten minutes and remove with slotted spoon. You may also pre-treat with lemon or pineapple juice, but this is much less effective and imparts a citrus flavor to the fruit. Dehydrate at 135° until pliable (8 – 12 hours). 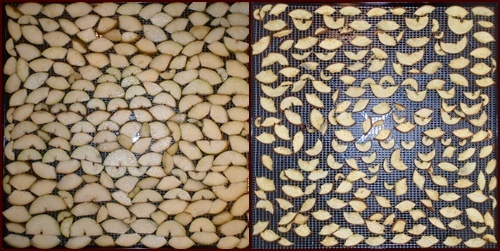 L – R: Dehydrating pears, before and after. Shown with skin on. Dried pears are very sweet and melt in your mouth. Wait until pears have ripened, but not softened too much before drying. Peel if desired. Cut the pears in half lengthwise. With a knife, trace the fibrous line leading from the stem down to the pit and make a shallow cut. Pull the fibrous part out. Slice the narrow part of the pear crosswise into ⅛ inch thick pieces. Cut the wide part of the pears lengthwise again and cut out the core. Slice the quarters crosswise into ⅛ inch thick pieces. 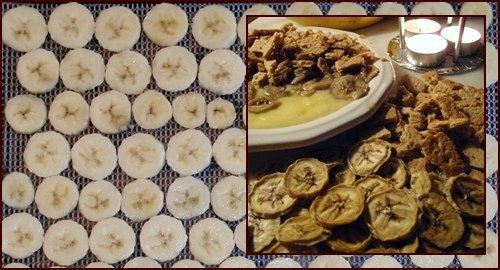 Dehydrating bananas for Grahma Nanna Nilla Pudding. Choose bananas with some brown speckles on the peel for maximum sweetness, but avoid drying over-ripe, soft bananas. Peel the bananas and slice crosswise into ⅛ inch thick pieces. 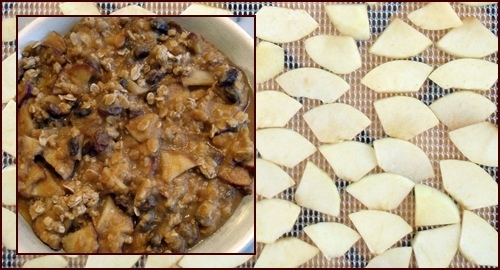 Dehydrate at 135° until chip-like or leathery (8 – 12 hours). Home dried bananas are not crunchy like the dried bananas you find in store-bought trail mixes because they are not fried before drying. 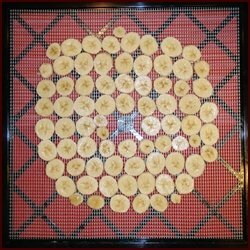 Dehydrating bananas is easier with flexible poly-screen tray inserts (standard with Excalibur Dehydrators) because bananas can stick to hard plastic trays. With the flexible screens, the dried bananas pop right off. Dried pineapple makes a surprising appearance in Pizza Grits Supreme. It also goes well with rice and shrimp or ham. Remove the fibrous skin. If you have a coring tool, you can remove the core before cutting. Otherwise remove the core as you slice the pineapple. Cut the pineapple crosswise into ¾ inch thick rings first and then slice the rings crosswise into thinner ⅛ inch thick pieces. Smaller pieces dry faster than larger chunks or rings and are the perfect size to use in recipes and trail mixes. Dehydrate at 135° until pliable (12 – 18 hours). If drying canned pineapple, it will take up to twice as long because of the extra juices. Shorten the time by running the dehydrator at 145° for the first two hours. 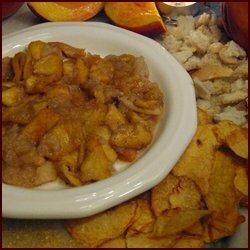 Right: Dried peaches rehydrated and warmed with sugar and bread crumbs make a fine peach cobbler. Firm peaches are easier to process and will dry faster than soft peaches. However, peaches that are very firm may lack sweetness because they are not ripe. Look for peaches that have good color and a little give when you squeeze them. If desired, remove the skin by dipping the peaches in boiling water for 30 – 60 seconds. Remove peaches with a slotted spoon and then dip in cold water. The skins will come right off. Cut the peaches in half or quarters and remove the pits and the fibrous red parts around the pits. Then slice the halves or quarters crosswise into ⅛ inch thick pieces. It’s easier to remove the pits of clingstone peaches if you cut the peaches into quarters since the pits adhere to the flesh of the fruit. The pits of freestone peaches pop out easily. Dehydrate at 135° until pliable (8 – 12 hours). Shorten the time by running the dehydrator at 145° for the first two hours. Dehydrating strawberries for Trail Angel Cake. Dried strawberries are only fair for snacking, but they are delicious when rehydrated and heated with a little sugar such as in the Trail Angel Cake recipe. Wash strawberries and pat dry with paper towels. Cut off the leafy crown and slice strawberries crosswise into ⅛ inch to ¼ inch thick pieces. If you want to sweeten the strawberries, sprinkle with sugar after you place the slices on the trays. Sweetening the strawberries in a bowl first draws out juices and makes them messier to work with. Dehydrate at 135° until leathery or crispy (8 – 12 hours). 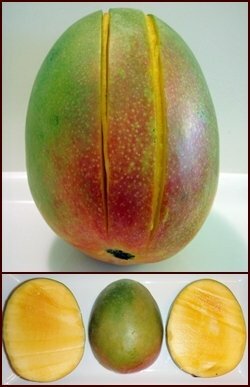 Top Right: A mango with two lines showing where to make the first cuts to the left and right of the pit. Bottom Right: The pit is hiding in the piece on the right. Orient the mango long ways with the narrow profile of the mango facing you. Make two cuts all the way down the mango about a quarter inch from center left and right. You may bump into the pit, so just keep sliding the knife along the pit. Cut the skin off the three sections. Cut the flesh off the pit in the center section as best you can into ⅛ inch thick pieces. Lay the two outer sections flat-side down and cut in half lengthwise and then slice the quarters crosswise into ⅛ inch thick pieces. Spread in a single layer on the dehydrator tray and dehydrate at 135° until pliable (8 – 12 hours). Shorten the time by running the dehydrator at 145° for the first two hours. 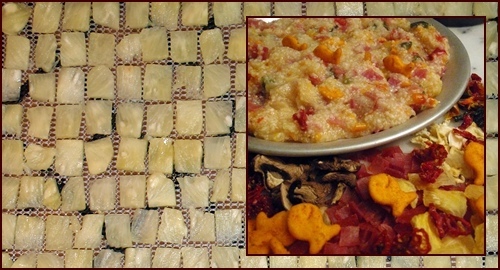 L – R: Dehydrating mango, before and after. Blueberries take a long time to dry and are only fair for snacking on. They are pretty good in oatmeal or make a nice topping for dried angel food cake when rehydrated and warmed. Wash blueberries and remove the stems. Break the skins before drying. Place blueberries in a colander and dip in boiling water for 30 seconds and then in cold water to check (break) the skins. Blueberries will dry faster and turn out crispier if you skip the dip and cut the berries in half before drying. Place the berries in a single layer on the dehydrator tray with the skin side down. Dehydrate at 135° until leathery (12 – 20 hours). 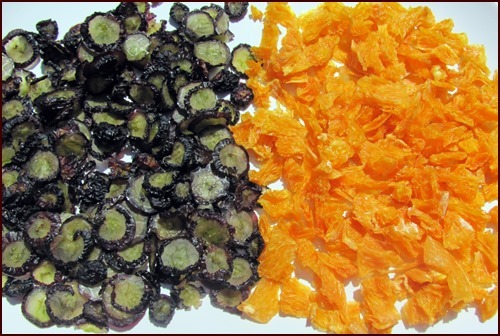 Dehydrator manufacturers always show sliced oranges in their marketing photos because they are colorful and healthy. I tried drying them sliced when I got my first dehydrator and was disappointed - they just didn't make good fruit snacks like apples and bananas. But, they rehydrate well in fruit cocktail! Slice the oranges and cut away the skins. Then cut the fruit into small pieces, breaking into the cell walls in between the sections. A tip if you have particularly juicey oranges is to partially freeze them before cutting. Dry them directly on the mesh sheets. They stuck to the mesh, but not too bad. I pull them off once and spread them around again for the last four hours. (135F). Oranges take a long time to dry, count on at least 15 hours. Slice the seedless grapes crosswise several times because they will not dry sufficiently if just cut in half. They stick to the mesh worse than orange pieces, but come off with a little effort. Sliced seedless grapes will take as long or a little longer to dry than orange pieces. Combine one cup of any combination of dried fruit with one cup water. Soak for ten minutes and then heat slowly for ten more minutes. 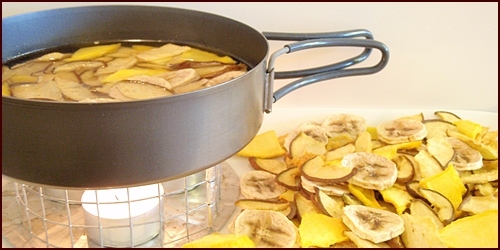 Try ½ cup dried pears, ¼ cup dried bananas, ⅛ cup dried pineapple, and ⅛ cup dried mango or peaches. 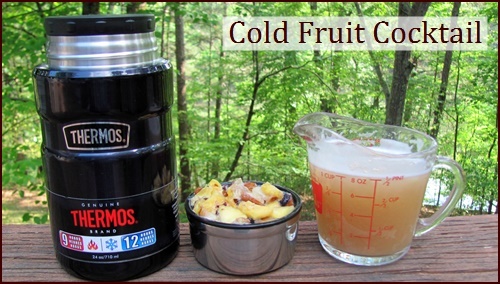 To make a juicy fruit cocktail, combine one cup of dried mixed fruit with two cups of cold water in a Thermos Food Jar. The result will be one cup of refreshing fruit juice and a tasty serving of rehydrated fruit. I add one teaspoon of sugar to my fruit mix to give me a little extra zip for the last miles of the day. 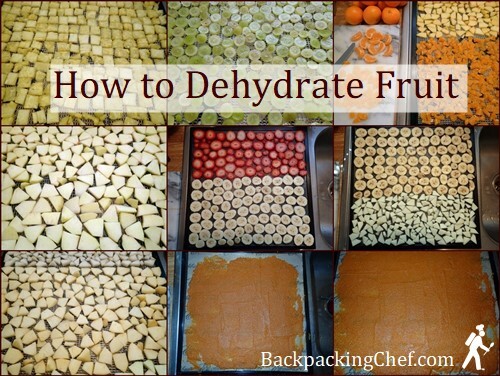 You will find all the instructions for dehydrating fruit in Recipes for Adventure, nicely formatted. Included are dried yields for all fruit used in the recipes. It will help you estimate how many cups of dried bananas you will get from five large bananas so you will know how many bananas to buy and dry for your backpacking menu. In the book, I show how to enjoy dried fruit in breakfast, dessert and fruit pudding recipes. 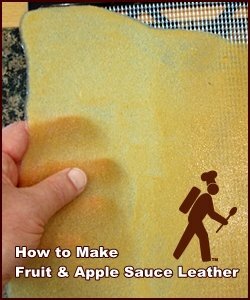 Fire up your blender and learn how to make fruit leather and apple sauce leather for snacking and puddings. Dehydrating Fruit, Vegetables, Meat, Sauce, Bark, Soup, Dog Treats, Vacuum Sealing and More!